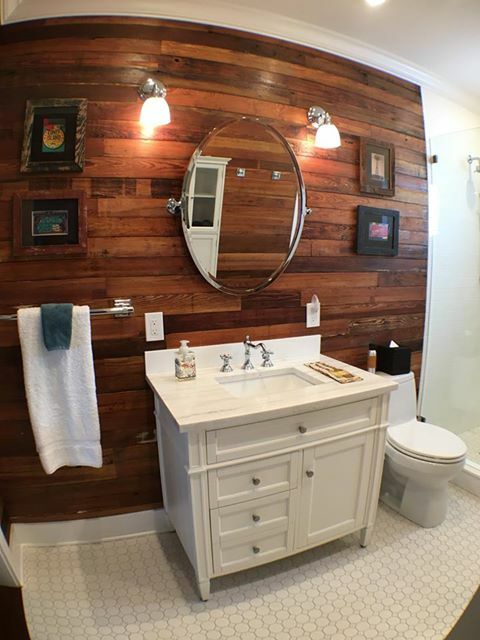 It’s easy to dream about your next bathroom remodel. From design blogs and decorating shows to product catalogs and Pinterest, chances are if you’re thinking about starting a major renovation project, you probably already have a look in mind. But especially when you’re shopping online, it can be a little difficult to visualize how something is going to look once it’s actually in your space. So today we have something a little different: two finished, real-life bathrooms submitted to us by one of our very own customers, built using our James Martin vanities, and photographed twice – once professionally, and once by the homeowner. Most of the places you’d go to find inspiration for a bathroom update are full of professional photos of staged spaces. At the very least, that means you’re getting angles and lighting you wouldn’t find in an everyday setting, and at worst, pictures of spaces that aren’t actual bathrooms at all, but wide, open sets specifically designed for taking pictures. 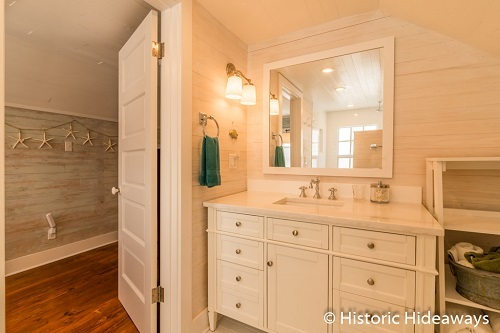 That’s because actual bathrooms – especially smaller ones – are really hard to photograph, so even actual bathrooms like this one require a little finesse and finagling to capture in full. A photograph taken with an ordinary camera in average light from a slightly different angle presents a dramatically different view of the same space. 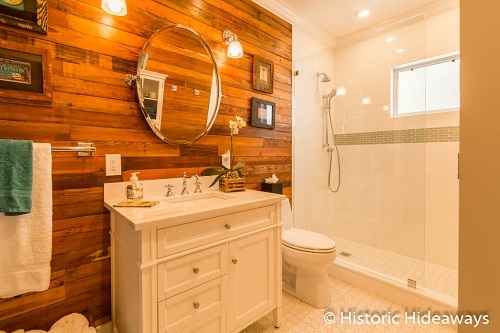 This photo is taken from the far corner of the bathroom (with a slight fisheye distortion to compensate for the angle), but the biggest difference is the lighting, which shows a different shade of the wood, the tile, and even the vanity. While neither photo is 100% accurate to what the bathroom will look like in person, the contrast illustrates how big a difference a little behind-the-scenes magic can make. Of course, this contrast also reveals a problem that every homeowner should consider heading into a big bathroom remodel. Because real bathrooms don’t come with built in photo-studio lighting (or at least I hope they don’t! ), it’s important to realize that the color you see in a product image might look very different depending on how much and what type of light your bathroom gets. 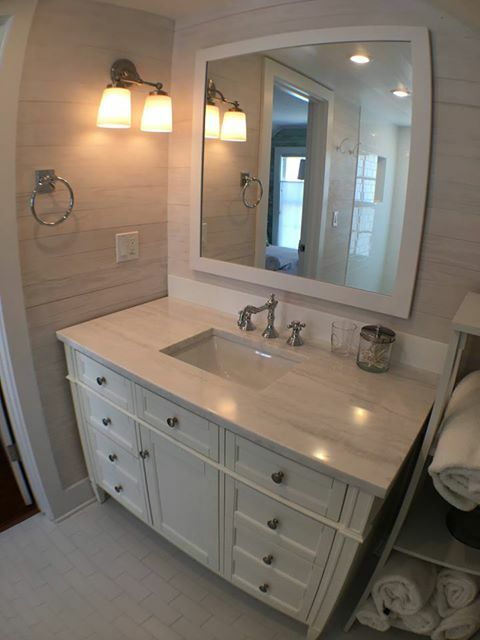 White vanities in particular can change dramatically with a room’s lighting, and while professional photographs tend to skew towards very bright white light or very warm light, in an actual bathroom you’re more likely to run into a shortage of light. In this picture, you get a better sense of how this Brittany vanity’s white paint presents in natural light (from the hall) and artificial light (from the vanity light), and how it’s impacted by shadow. Though it’s exactly the same bathroom, the change in lighting gives the room a much cooler feel. Here again, actual project photos (rather than official product photos) can help you get a better sense of what a vanity will look like once it’s set up, and account for your real-life lighting conditions – especially if you’re looking to update a windowless bathroom. This entry was posted in Bathroom, Bathroom Vanities, Decorating Ideas and Tips and tagged Bathroom Remodels, Bathroom Renovation, Bathroom Vanities, James Martin Bathroom Vanities, James Martin Furniture.